There is no single transmission mechanism - hence it's always going to be complicated to present. There are big differences between US and UK monetarists. We've learnt new things about the transmission mechanism since 2008 but there's a pedagogical inertia that retains existing work. On first glance this is exactly the type of way to present such a tricky topic. It lays out several alternative channels, clarifies their background (i.e. presents credit view as slightly separate), and shows how they impact output. But it's not coherent. The key distinction between "interest rate" and "asset price" effects is flawed on the grounds that the interest rate matters because it's the price of bonds (i.e. an asset), whilst each of those asset price effects - whether it's the exchange rate, equity prices or credit markets - rely on interest rate changes (albeit the "cash flow" channel relies on nominal rather than real interest rate changes). This is why I struggled as an undergraduate - it's aint MECE. Not very helpful. 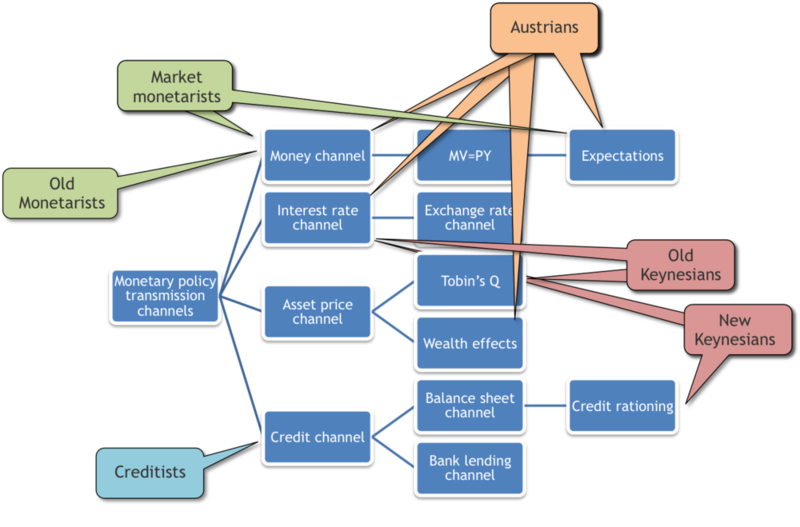 One can also look at the Bank of England, and the ECB, but they leave out lots of important present-day channels. So help me out - where's the difinitive explanation of the transmission mechanism?